A Native American Theme. 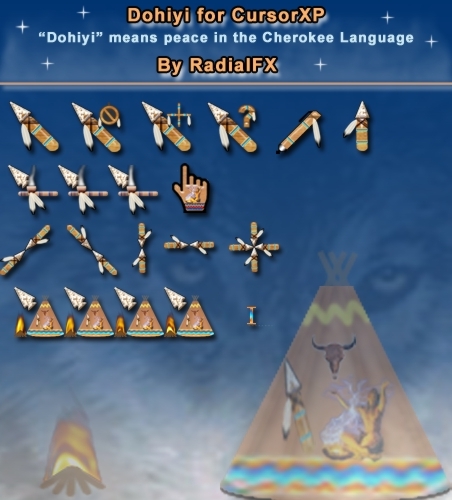 "Dohiyi" means peace in the Cherokee Indian language. Special thanks to Candicolette for providing the theme I patterned these off of. I kept the animations down on these to preserve the "Peaceful" nature of the theme. I hope you like them. WOW!!! I liked this set immediately......beautifully excuted.Peace. Very nice Cursor Very serene, and I like the soft colours. This is a wonderful cursor, Radial_FX! The Native American theme is alluring. Take a bow, my friend. You did a great job...I like the working and busy animations...smoke and fire...too clever! Another winner from Radial_FX! I like this one! I think you captured the feeling you were going for. I really like these theme based cursors! Way to go! Excellent job and I want to thank you again. I like it. It's usable and original. Great job! Awesome 10+. This theme shows a nice feeling towards Native Americans. Great Class. Radial, I e-mailed you back yesterday and my mail got returned today. ( Wahhh! I tried re-mailing you but dunno if you'll get it. Do you have a regular old webmail addy (hotmail, yahoo etc.) I could forward it to if it doesn't get through again? Anyway, your e-mail really cheered me up yesterday! Hi Shmoop, Yes I got it today. My e-mail was down until today around noon. Did you get mine back? Hey Mr. T (Tombala), Robot, ChasUGC, candi, babylove,phooey, my ol buddies Bear and Ingui thank you very much! These cursors are gorgeous. Thanks for all your work. I love this cursor set. will you possibly be doing a wb theme to match? or even a background. I like the background you've used here in the screenshot, with the wolve's eyes shining through. Thanks wulfn1, yes I have thought seriously about making a wallpaper out of this. I will probably do that soon now that someone has asked. Yes, there is quite possibly a skin in the future also. Thank you very much for your nice comments. WayaAgisi, Thank you very much. The theme has a real sense of purity in it and I really enjoyed making it because of that. Again, Thank you. Good Job! I LOVE IT. I'm glad to see this Native American cursor set. Please come up with some more of these. (Maybe a Suite? ).